The Pure Baby: Yummy Summer Ice Cream! After playing outside on a hot almost-summer day, The Pure Baby's (PB's) big brothers enjoyed a ice cream treat :) In addition to being on The Feingold Diet, PB's oldest brother (on left) is also casein-free. Basically, being casein-free (CF) means that he does not consume any milk/dairy-related products. For children on the autism spectrum, casein can cause gastrointestinal issues. Thus, keeping casein out of the diet prevents gastrointestinal conditions such as constipation and diarrhea. 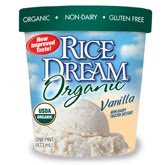 Happily, PB's oldest brother can still enjoy a summer ice cream-like snack called Rice Dream :) Rice Dream is casein-free and comes in a few different flavor choices. Additionally, we make it extra special with Ah!Laska organic chocolate syrup! We're Getting a New Kanga XT!